I have been feeling a bit disconnected from my creative inspiration of late, so have decided to intentionally stoke the fire. I’ve found for myself that the muse reveals herself when I can connect to that more universal and abstract sense of being, experiment with embodying various aspects of self, and momentarily entering the dark corners. I participated in a very useful retreat in the fall last year called The Creative Entrepreneur (posts about it: day 1, day 2, day 3, day 4, day 5), where we worked through blocks and flows through a process of visual journaling. It’s surprising what comes out when the right brain is given the opportunity to run wild a bit, so I’m reengaging in that now. 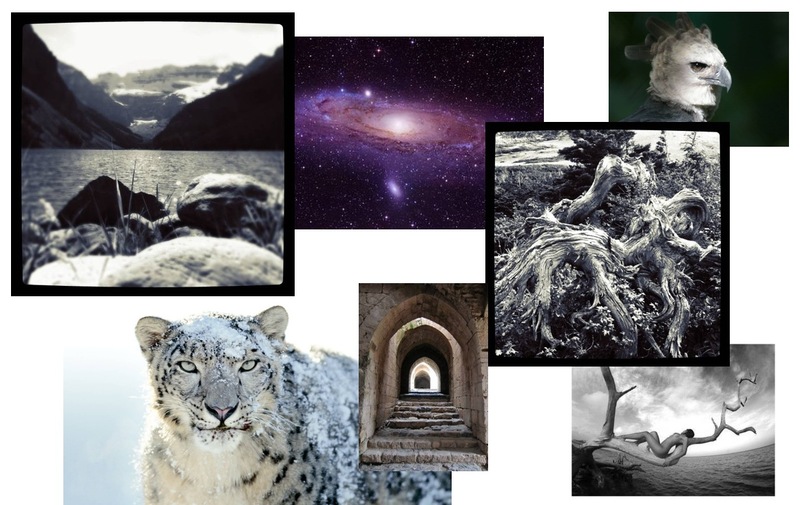 As you see above, I put together a collage of images that are symbolic, metaphoric and archetypal in some way. I try not to think too much about it, I just choose images that feel right at the moment. The patterns emerge later. To create the collages, I’ll be using the new hive – a surprisingly simple and fun tool for creative expression that was exhibited at the Bazaar at the Contact Conference on Thursday. If you’d like to join me on this series of self-explorations, feel free to post links to your work in the comments. Woah – your posts from last year are fantastic! You timed it perfectly for me, too: I’m picking up the Artists Way this week, after dropping the ball and taking a month hiatus, and I’ve really felt the need for some outside inspiration. I am happy to have found it in this unexpected place. Have a wonderful and creative week!